It is appropriate and necessary to scrutinize the response of the Central Government in a non-partisan and fearless manner as required in a democracy. When the 2001 Bhuj earthquake occurred, Prime Minister AB Vajpayee issued an appeal for contributions in money and kind addressed to ” Dear Brothers and Sisters” giving a list of officials to be contacted along with their contact particulars. Indian bureaucracy swears by the precedent and hence it is surprising that a similar letter was not issued this time. However, the same bureaucracy has availed of another precedent and acted in a manner injurious to national interest. To start with, there is some disinformation about the offer of $100 million made by the Crown Prince of United Arab Republic. But, the basic facts are clear. The Crown Prince spoke to India’s Prime Minister offering a sum of $100 million. We do not know how Modi responded to the offer. We may note that the Ministry of External Affairs did not give any information about the conversation. The Chief Minister of Kerala spoke to the media about the offer. Thereupon, External Affairs Ministry came out with a statement to the effect that it is India’s ‘established policy’ not to accept money from foreign governments. Immediately, UAE denied that it had offered any specific amount. Obviously, that is what any competent Foreign Office would have done as it will be embarrassing to let the media carry a story that UAE’s offer, offered by the Crown Prince, was rejected. As a matter of fact, one day before the UAE offer was made MEA had sent out instructions to Ambassadors abroad to decline offer of money from foreign governments if offered. The ambassadors were to convey the decision not to accept money only if it was offered. Let us look at the reasoning behind the decision to decline foreign government contributions. The MEA spokesperson has repeatedly referred to ‘an established policy’. That statement is wrong as the 2016 National Disaster Management Policy does say in so many words that while India would not ask, any assistance offered voluntarily can be accepted if cleared by External Affairs (page 145). Informally, it has been clarified that for the 2004 Tsunami and the 2005 earthquake in Uttara Khand the Manmohan Singh Government had decided not to accept money from abroad. It had been then suggested that India seeking a permanent seat on the Security Council should not be seen as incapable of dealing with disasters without foreign funding and assistance. The reasoning does not hold water. Has India’s credentials for holding a permanent seat improved as a result of not accepting money? In this context, it will be pertinent to recall the 2005 Katrina Hurricane that devastated the south- east US. When foreign governments offered assistance, initially Washington said it did not need such assistance. However, within days, Secretary of State Condoleezza Rice called her French counterpart and asked for assistance. 500, 000 water bottles were sent by European Union. India sent 25 tons of relief material by air and gave $ 5 million in cash. If the superpower USA can correct an initial mistake and accept help, the question arises whether India has anything better than false pride and an irrational obsession with precedent for its decision to reject aid offered by UAE without asking? It was the 17th century French philosopher who said that had Cleopatra’s nose been shorter the face of the whole earth would have been different. If India had gracefully accepted the $100 million from UAE, other governments in the Gulf and elsewhere would have, without our asking, offered money. We might have got a $1 billion or more. There would have been a healthy competition among the GCC members. Foreign ambassadors in Delhi have privately told me that they want to give money but did not want to cause embarrassment either to their government or to India. They were rather surprised that MEA should have ‘advised’ the Thai Ambassador not to be present when some Thai companies were handing over relief material. Shocked I was, but not surprised. The Koottayma (community meeting) of the Malayalees in Delhi at a meeting held in Kerala School recently has decided to do its utmost to make the Union Government change its position. They have written to all the MPs from Kerala to take up this matter with Minister of External Affairs and with Prime Minister if necessary. A state government has limitations in arguing its case with the Centre and hence the MPs should take the lead. This author remembers the dharna staged by the Kerala MPs to bring back from Kuwait the stranded Keralites there when Saddam Hussein decided to have a picnic there in August 1990. It is human to err, but it is equally human to correct oneself. 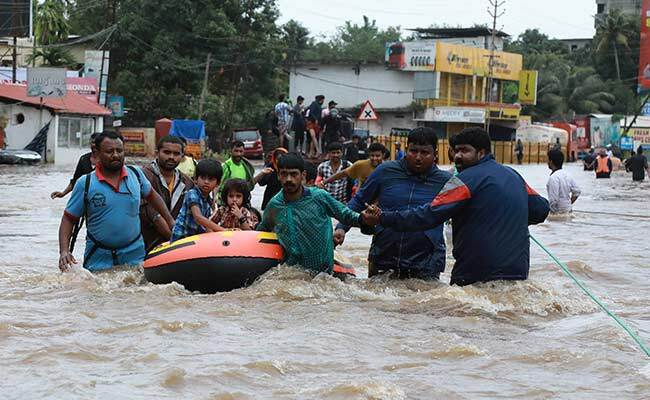 Kerala needs money and the Central Government does not have enough to give the 40,000 crores of Rupees that Kerala needs.Let us not forget, Vasudhevaikakutumbakam. Ambassador K. P. Fabian is an Indian Diplomat who served in the Indian Foreign Service between 1964 and 2000, during which time he was posted to Madagascar, Austria, Iran, Sri Lanka, Canada, Finland, Qatar and Italy. During his time in the diplomatic service, he spent three years in Iran (from 1976 to 1979), witnessing the Iranian Revolution first hand. As Joint Secretary (Gulf), Fabian coordinated the evacuation of over 176,000 Indian nationals from Iraq and Kuwait in 1990–91. His multilateral experience includes representing India at the United Nations Industrial Development Organization, International Atomic Energy Agency, International Civil Aviation Organization, Food and Agricultural Organization, World Food Programme and the International Fund for Agricultural Development. He is also the author of two books, Commonsense on the War on Iraq, which was published in 2003 and Diplomacy: Indian Style. You want to know about the reason that this particularly makes me mad? … I spent the time contacting over thirty US people in our federal government to help — Senators, House of Congress Reps, governors and so on. I also contacted aid organizations to help. What a waste of hours out of my life! ,,, You need to rise up in a nonviolent way and DEMAND change.